Thank you for joining me on the blog tour for Unforgivable by Mike Thomas I’m delighted to be sharing my review today along with an extract. In a city where tensions are already running high, DC Will MacReady and his colleagues begin the desperate hunt for the attacker. If they knew the ‘why’, then surely they can find the ‘who’? But that isn’t so easy, and time is fast running out . . So heavy, all this clothing. This rucksack. So hot. Under cloudless sky he strides towards the entrance, across sculpted lawn and immaculate block pathways, the open space peppered with bag-laden shoppers, with Pret-stuffing businessmen, with giggling teens who sit beneath trees and sup on lattes, on iced drinks, smartphones never more than a few inches from their faces. People forget so quickly. Yesterday, the day after Bessemer, the Al Mahdi, they were fearful. Of enclosed areas, of large gatherings. He saw it on their faces: in railway stations, on buses, in the city centre’s pubs and bars and clubs. A tension there. Anxiety fizzing beneath the surface. Casting sideways glances. Watchful. Nervous. Trying not to appear so. Now not one of them looks at him. Widens their eyes as they take in his appearance. Reels backward in terror as they push themselves away from him. Even after the news reports this morning, the photograph that is everywhere. There is nothing. Not a flicker of recognition, of anything remotely close to vigilance. Just ignorance and apathy and self-absorption, shocking in their measure, and deserving of punishment. The skin between his shoulder blades prickles, a square of cold sweat. Head low, tucked into the raised collar. Baseball cap too tight on his head, pinching at hair and scalp. Sunglasses heavy across the bridge of his nose. Hands wrinkled and sopping inside leather gloves that he has jammed into the pockets of his jacket. The hiss of white noise in his ears, growing louder with every step. It’s fair to say I love my films. And I love me a bit of TV, if you discount snooker coverage, soaps and all reality shows – I am proud to admit that I never watched Big Brother after the first series, and wouldn’t know what a TOWIEwas if it kicked me in the plums. As a writer, I find there’s nothing better than hitting the sofa or cinema chair and soaking up other people’s work as it plays out on the screen. Absorbing it all. Just having that hour or two of mental space away from your own creative endeavours while you enjoy somebody else’s. There’s a definite link between the novels I write and the things I watch. As a kid, devouring books, I also developed a love for television – Tom Baker’s Doctor Who, for starters – and came to adore the cinema. I can remember sitting with my mother and having the bejesus scared out of me during Sinbad and the Eye of the Tiger, when the evil Zenobia runs out of the potion required to turn her back into a human. When I saw her foot, mangled and marbled and still that of a seagull, I cowered into my mother and the film’s work was done: I went home and wrote stories where people turned themselves into all sorts of weird and troubling malformed creatures, a cabal of half-human, half-animal horrors. Now, when I write, I picture the scene as if it were through the lens of a camera – the zooms and quick pans and dolly shots and fades to black. The wipes and overhead crane views, the tracking of characters as they move from room to room. The moving image has had such a profound effect on my life that I can’t work any other way. So what films and TV shows inspired my latest novel, ‘Unforgivable’? The book covers five days in the UK city of Cardiff, which has been brought to a halt by a murderous bomber who is attacking the populace. I wanted it to be rich with detail, stuff that I learned during my twenty-plus years as a cop. But more than anything else I wanted it to be taught, mean and pacy as hell. 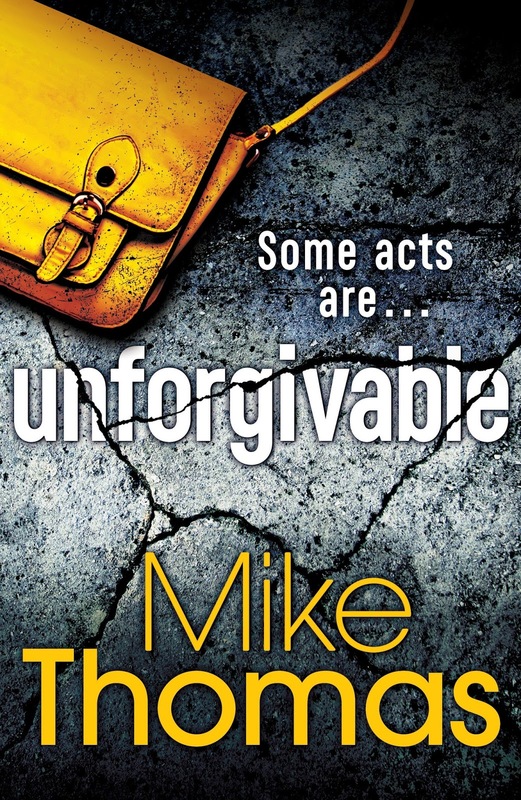 I’ve heard nothing but good things about Unforgivable by Mike Thomas so I am thrilled to be taking part in the blog tour. Today I have an extract for you but look out for my review over the next week or so, and don’t forget to visit the other stops on the tour. He sits amongst the detritus, the remnants of fast food and discarded bottles of alcohol and the thick stench of his own flesh, the television remote control resting on his naked white stomach, the matted hair around his filthy navel curling up along the handset, his eyes unblinking and on the images flickering across the television screen. Smoke and misery and the pulse of blue lights. A breathless reporter, face smudged, his puny hands twisting at a microphone as he struggles to put into words what he has witnessed. What his eyes have seen that can never be unseen. His fey, bland voice battling to explain the unexplainable as inoffensively as possible. Must not affront anyone. Must not fan the outrage. Be inclusive. Be diverse. Be bland with your tamed tongue. In short: a fortysomething, six feet six, seventeen stone ex-cop turned author and writer-for-hire. I live with my family in the recently-burned-down middle of Portugal, having moved here four of years ago. I was a police officer in South Wales for more than two decades, working the Valleys and the capital city, Cardiff. My first two novels – Pocket Notebook and Ugly Bus – were published by William Heinemann and longlisted for various awards, and I was a Waterstones New Voice in 2010. I’m now with Bonnier Zaffre, who are releasing the MacReady crime novels. The first, Ash and Bones, was published last year while the follow-up, Unforgivable, was out last week. If you do the Twitter and fancy abusing an ex-plod in real time but without the risk of being struck with a baton in reply, I’m @ItDaFiveOh. Come say hello. I always wanted to write crime fiction. My protagonist, DC Will MacReady, has already featured in three novels written between 2004 and 2007, and which will never see the light of day as they are unimaginably awful. But they were my very steep learning curve; I’ve always written and thought – misguidedly – that as I was also a cop then writing a crime novel would be an absolute doddle. So I put MacReady away and got side-tracked doing a couple of ‘literary’ novels and it was after those that I thought I had the tools to bring him out, dust him down and do a proper job. So far nobody has stopped me. Maybe they’re scared due to my size. Human beings are endlessly fascinating. I’m a real people watcher, and while in the police I used to spend a lot of time trying to work out why we treat each other the way we do because sometimes we really are cruel to one another. In the end I just realised as a species we are brilliant but not a little bit stupid. I dealt with a lot of awful things in the job, too, so writing is a little bit cathartic. My first novel just poured out of me in a rage – I hated being a cop by that point, it had turned me into a person I didn’t really like very much…. Mike Thomas was born in Wales in 1971. For more than two decades he served in the police, working some of Cardiff’s busiest neighbourhoods. He left the force in 2015 to write full time. Mike has previously had two novels published and was longlisted for the Wales Book of the Year and was on the list of Waterstones ‘New Voices’. His second novel, Ugly Bus, is currently in development for a six part series with the BBC.